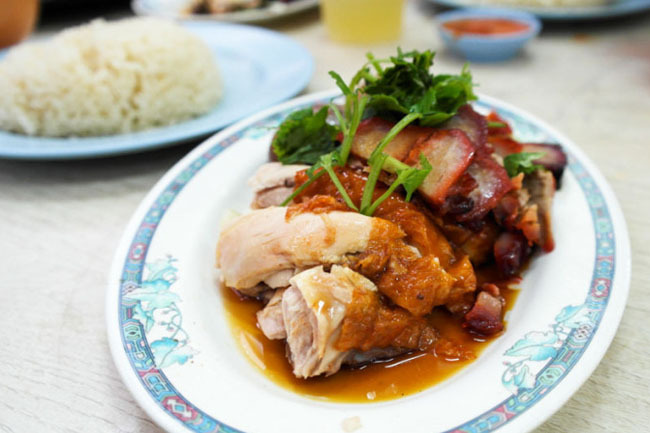 10 Singapore Food Bloggers and Their Favourite Local Hawker Food! SG50. 10 Singapore Food Bloggers. 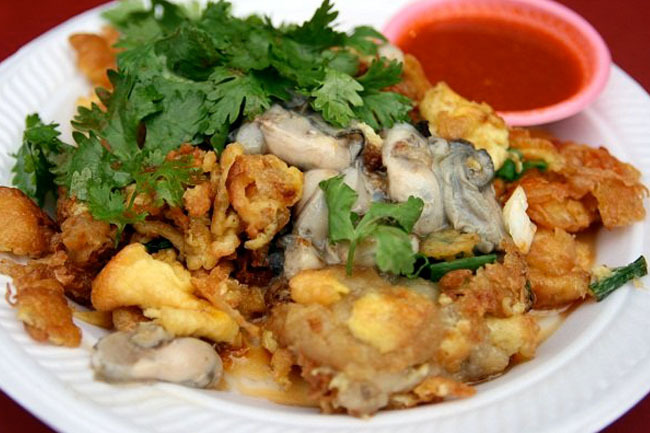 9 Favourite Local Hawker Food. I start this post by saying a big “Thank You” to all 10 blogger friends who chipped in for this entry. This post started when I was truly curious about what hawker food my foodie friends like, especially since their childhood days, and if there are any interesting and memorable stories to share. Many food bloggers choose a focus for their writing. Take for example Johor Kaki who writes on food places across the Causeway. I know we really eat just about anything from home-cooked meals, street food, cafes to restaurants, but don’t exactly blog about everything. So what is that one local hawker dish and stall that holds that special place in our hearts? One thing to add is, I am proud to be part of this local food blogging community where friends provide advice, help and support, other than the occasional makan sessions when we do meet up. Thank you Catherine, Charleen, Leslie, Tony, Brad, Maureen, Nicole, Nat, Seth and Derrick for your help. 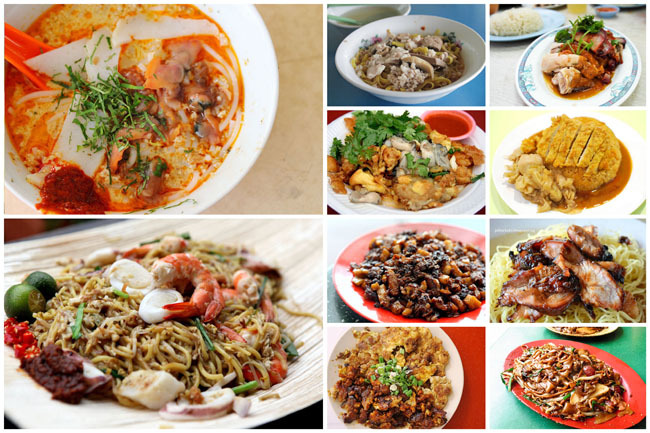 10 Singapore Food Bloggers and Their Favourite Hawker Food (listed in alphabetical order). My favourite hawker food isn’t one that I allow myself to eat too often. It’s Oyster Omelette or “Or Luak”. It’s the combination of crispy egg, gooey starch and the unmistakably seductive flavour of oysters that make this irresistible. Dip it into a good tangy chili sauce and let the flavours rrrrip! It is worthwhile tracking down the better ones to make this sinful grease bomb a worthwhile treat. Also because nothing is worse than badly made Or Luak. I discovered that you shouldn’t go too early. The griddle benefits from being heated up for some time. Yes, wok hei is important – I once tried oyster omelette too early and it was just not the same. So this is a rare but beloved treat. Luckily I love plenty of other hawker dishes too, like kway chap, satay, sliced fish soup, hokkien mee and char kway teow (oddly I am not fond of chicken rice. I can go years without eating it). But a good plate of oyster omelette always cheers me up. Hainanese Curry Rice because the Hainanese in me loves a messy and an intense complexity of flavours in her food. This dish in particular, satisfies that criteria deliciously well. 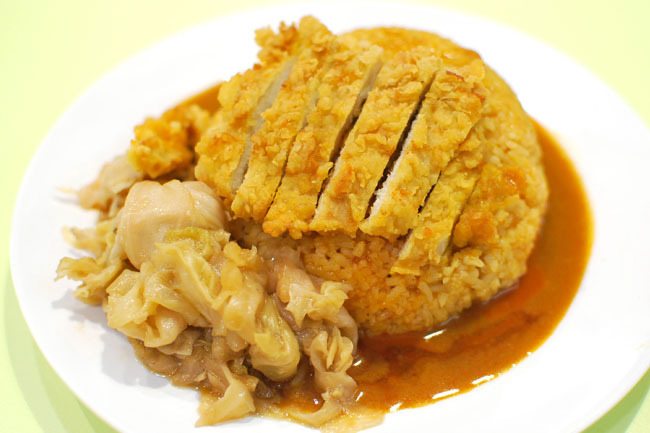 Truly Curry Rice (formerly at Blk 79 Telok Blangah Drive Food Centre, #01-29 which has now moved to 153 Kampong Ampat, Jun Jie Industrial Building, #07-05) is one of my favourite places to go for Hainanese Curry Rice. It has recently been renamed as Truly Test Kitchen. I first ate at this stall about 8 years ago when it was formerly run by the senior Tan in Telok Blangah. Now that his daughter and her business partner have taken over, and even expanded the stall to a coffee shop, I am happy to see the continuity and evolvement of this humble curry rice stall. Not forgetting of course, the consistency of the quality of their food and the piquant curry that covers every single grain of rice, making the whole plate a winning formula through the years. Hokkien Mee. When I was a kid, there was a Hokkien Mee stall in a coffeeshop opposite my flat and I would use to buy it home to share with my brothers. One packet was never enough for 3 hungry boys! But we always looked forward to a Hokkien Mee supper. 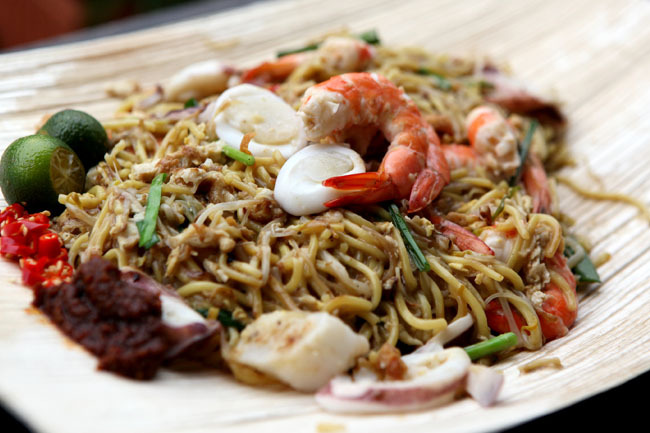 If I wanted to have really good Hokkien mee, I would look up Alex of Geylang Lor 29 Hokkien Mee. (At 396 East Coast Road) He has been frying for over 40 years and is still using charcoal! I have never been disappointed and all my guests always leave impressed. I invited Alex to be one of our hawkers in the very first ultimate hawker fest and we had to go through so much trouble to get him a portable charcoal fire! When we finally managed all that, it rained so hard during the day of the festival! But the people continued to just queue up in the rain just to get their plate of Hokkien Mee. It would always bring a smile to our faces whenever we talk about it! Wanton Mee. Perhaps because when I was a child, my immediate next door neighbour in Toa Payoh is a popular wanton mee hawker. I like the fragrance of fresh egg noodles and remember that as children, we were thrilled taking our turns to ride and bounce on the fat bamboo pole used to knead that giant lump of egg and flour dough. I also like the rumbling sound of the trembling rickety dough cutting machine. 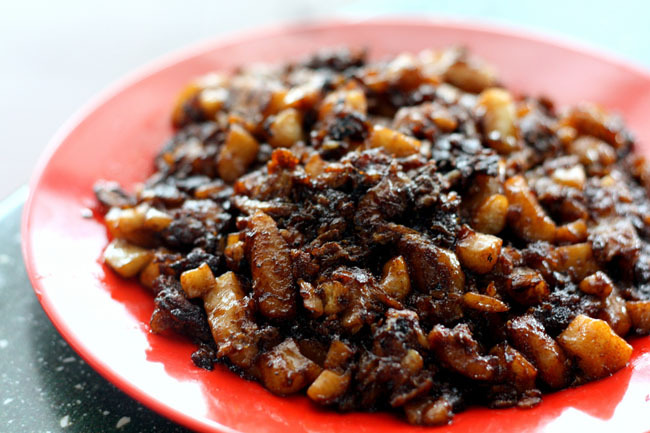 My favourite in Singapore is Fei Fei 肥肥 in Yuhua food centre in Jurong East (not Fei Fei 飛飛 of Joo Chiat). 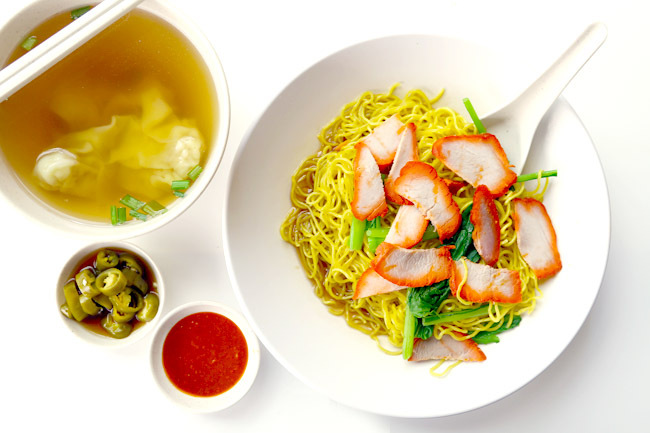 It’s got most of the elements of good wanton mee just right. Soft al dente, angel hair eggy noodles, aromatic tasty sauce laced with savoury sweet roasted char siew drippings, chunky tender charcoal roasted marbled 半肥 char siew, anchovy based broth, and wantons with fresh shrimps all for SGD3.00 a set. I have been eating at this stall long before I was a blogger. We used to come here every Sunday for brunch after 2 hours climbing Bukit Timah hill. Gladly struggled to find a car park lot and then stood and queued for up to an 1 hour sweaty and tired just to get our weekly fix. 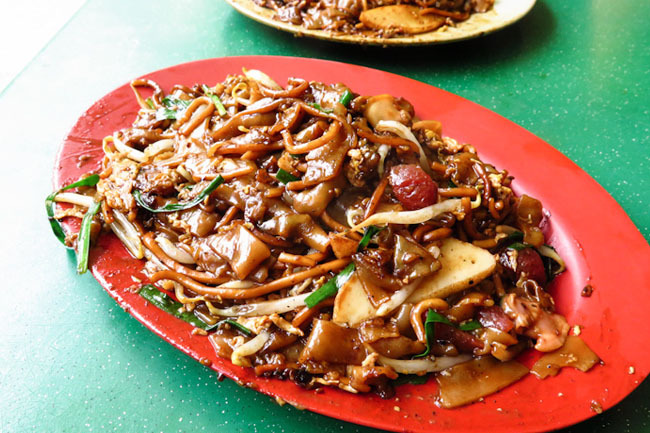 Char Kuay Teow, and my favourite place to have it is at Zion Road Riverside Food Centre. I like Char Kuay Teow because it has all my favorite ingredients like egg, beansprout & the Chinese sausage lup cheong in it. I like the glittering of oil on the surfaces of the noodles and kuay teow, and I like how the lard enhance the flavor and taste of the dish. Few people would know I grew up eating from this stall. Always love watching the action in action and how he dedicatedly fry every single plate based on each customer’s preference. Black Carrot Cake. I like the eggy-ness and the dark sweet sauce. Song Zhou’s (at Bedok North Interchange) black carrot cake is very very fragrant and wet. Each piece of carrot cake is so soft with aromatic charred edges. What I love about it is, they are very generous with the eggs and black sauce, hence giving it a sweet and savoury taste. 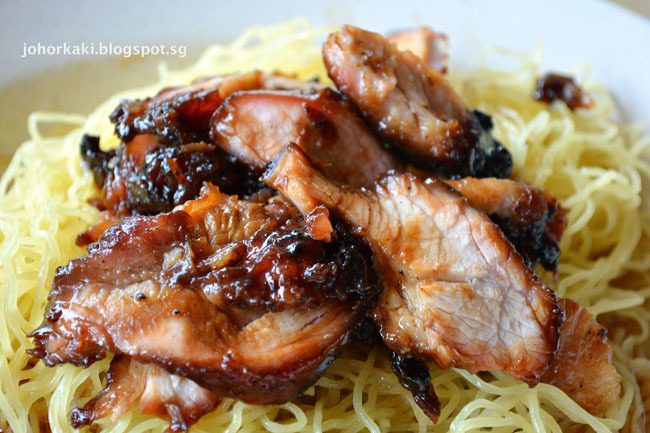 This is one of the hawker dishes which brings back a lot of memories. Because there used to be a carrot cake stall at the food centre near my house and my grandpa will always buy it for me for supper, or during tea time. That carrot cake stall may not be the best, but whenever my grandpa buys for me, it always make me so happy because it is like ‘jia liao’ (adding ingredients) to our usual meals. 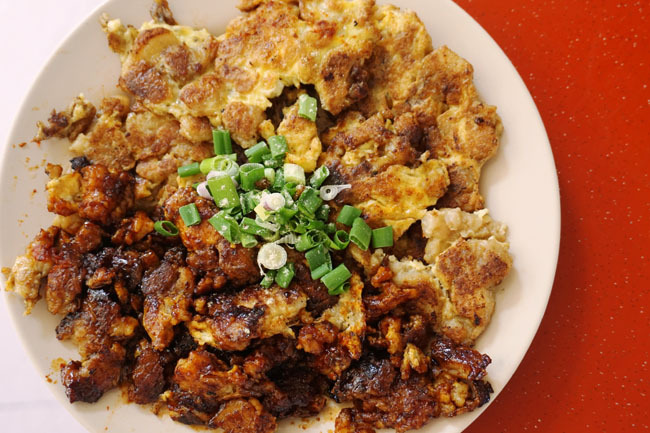 Chicken Rice and Wanton Mee counts among my favourite Singapore hawker food, but when it comes to one which also holds extra sentimental fondness, Fried Carrot Cake takes the special spot. Having had first-hand experience in running a stall selling this local delight when I was much younger, I’ve learned to appreciate the preparation behind this seemingly simple dish. One stall which I frequent is located just across my (previous) office at Zion Riverside Food Centre. Bak Chor Mee, because it is under-rated, and because it is the only Singaporean dish you cannot find anywhere else in the world, not even Malaysia. (Malaysia has a variation of BCM but it’s not the same.) It is the first food I eat when I return to Singapore after a trip. 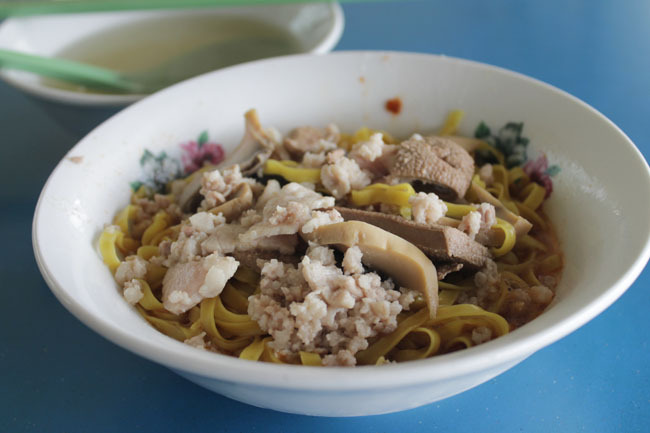 Some stalls have amazing Bak Chor Mee, a cut above the rest. But most stalls are good or average; you very seldom get a bad bak chor mee. If it’s really bad, just ask for more vinegar to douse the noodles. So I just eat at the stall below my block. I have no interesting story about the stall below my block, except the auntie calls me shuai ge, and she knows my order without me ordering: mee pok dry, less chilli, more vinegar. My favorite hawker food is Chicken Rice. I used to go to Leong Yeow famous Waterloo St Chicken Rice very often when I was still a student at SMU since it was nearby. Queues were always very long at Leong Yeow especially during lunch time. The chicken is really oily and that’s how I liked it, while the char siew has a great honeyed marinate. Once I queued a good 30 mins at the main queue before reaching the front and the uncle told me da bao can queue separately, faster. Since then I always ‘cut’ queue by queuing for takeaway but would still end up eating at the coffeeshop. My favourite hawker food is Laksa. Since young I have like spicy food like otah otah, curry chicken, har bee hiam etc. More important. it comes with my favourite cockles. That is why laksa has always been my favourite hawker food. 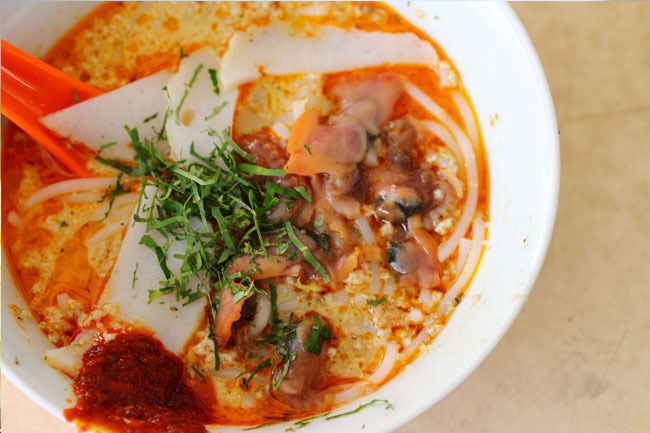 My favourite stall to go for laksa has to be Sungei Road Laksa at Jalan Berseh. It is probably the only laksa stall that still insists in cooking their laksa gravy over charcoal fire. The gravy itself was not too lemak and oily. It also has a nice aroma from the dried shrimps. The bowl of laksa is served with only a spoon. You do not need chopsticks as the thick rice noodles were already cut into smaller strips for easy consumption. Topped with slices of fishcake, beansprouts, cockles and laksa leaves at only $2 a bowl, this is probably also one of the cheapest laksa stall in Singapore. I used to eat wanton mee at least 3 times a week. Whether it is the old-school Singapore type, Malaysian, Hong Kong or Thai-style, I love all of them. My mum bought us Hua Feng from Tiong Bahru market (which has unfortunately closed) every Saturday morning when I was in primary school, and I would wait wide-eyed in anticipation for her return. The springy noodles mixed with green chili, and that salty oily base sauce that the noodles would soak up was just pure bliss. Another stall I would frequent was Nam Seng from the coffeeshop outside the old National Library. I would save up pocket money to have a plate after borrowing books. (I would tell my parents I was going to the library for revision, but there was this other major reason which I didn’t tell them.) Granny Leong aka Poh Poh still works at her eatery Far East Square. Still healthy and going strong, and when I asked, she revealed she is 86 this year. * All photos are provided by the respective blog owners. Nice blog ! thanks for sharing this nice post with us. Love this interesting and meaningful project. Thanks Daniel for the opportunity to participate.